provides authentic and innovative Greek cuisine in a relaxed seating by Honolulu 's popular Koko Marina's water front. 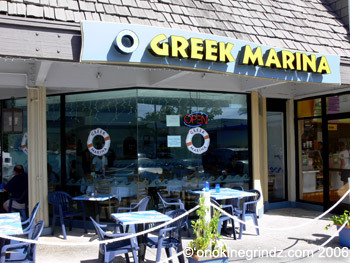 The Greek Marina offers both the comfort of indoor seating and the joy of Hawaii ’s weather outdoor. The atmosphere is a must with soothing Greek motifs and music. Our menu presents a great variety of Greek delicacies of tasty and healthy Greek cooking with the right and fresh ingredients. The restaurant is available for lunch and dinner 7 days a week, private parties and catering are welcomed.